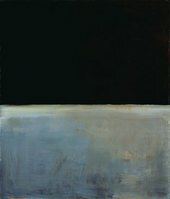 The Black on Gray paintings were Rothko’s final series. Like the Brown and Gray works on paper, colour has been extracted to a dark upper and a lighter lower section. Most striking is the painted white edge within which the composition is circumscribed. In all of Rothko’s earlier work the edges of his paintings folding around the stretcher had been meticulously painted. In marked contrast, the white surround of the Black on Gray paintings sharply demarcates the painted surface and collapses the pictorial space into a much flatter picture plane. Previously, Rothko had used a mixture of rabbitskin glue and pigment to douse his canvases in a first layer of colour. The Black on Gray paintings, however, were primed with white gesso which shows through in various areas, further contravening any illusion of pictorial depth. 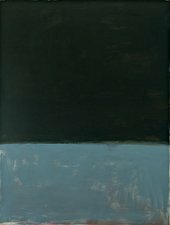 Unlike the Brown and Grays, where the variations occur within a fixed format, the Black on Gray paintings substantially vary in size and orientation, each offering a completely unique exploration of scale and ‘weight’. 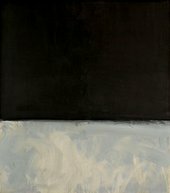 The Black on Gray paintings bear witness to the tireless effort with which Rothko kept pushing the boundaries of his practice; which may also explain why one evening in late 1969 he opened his studio to select members of the New York art world to view his latest paintings, the first and only time he presented a series as such.